Mozilla Thunderbird is the most popular open source email / news-feed client. It is free and available for all operating systems such as Windows, Mac OS X (Leopard, Lion..) and Linux based OS such as Ubuntu 10.10, 11.04, 11.10. Ubuntu (upto the version 11.04) ships with Evolution Mail client, although it has a lot of features but Thunderbird is much simple and easy to use; from the next Ubuntu release (Ubuntu 11.10 – code named as Oneiric Ocelot), Thunderbird may be the default mail client. 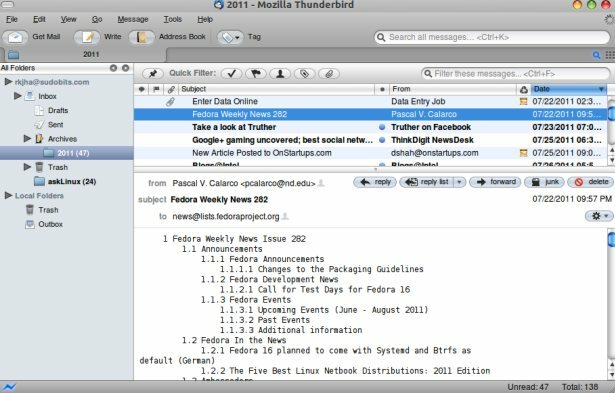 Thunderbird is one of the popular software from the Mozilla Foundation. It is popular because it’s very simple to use, and it has a lot of features with great user interface. The most important feature is that you can customize it as you want, extend it as you want because a lot free plugins are available on the web. 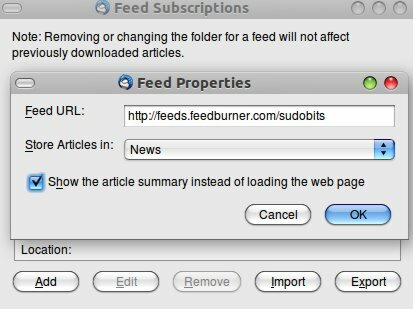 It has built-in RSS/Atom reader, so it can be easily used as a news aggregator. Here is a snapshot of Thunderbird, running on my Ubuntu Desktop – with a Mac OS X theme. Installing Thunderbird on Ubuntu 10.04/10.10/11.04..
step 1 : open thunderbird (if you are using older version then you can find it in Applications->Internet menu other wise just search for it in the top left search bar). 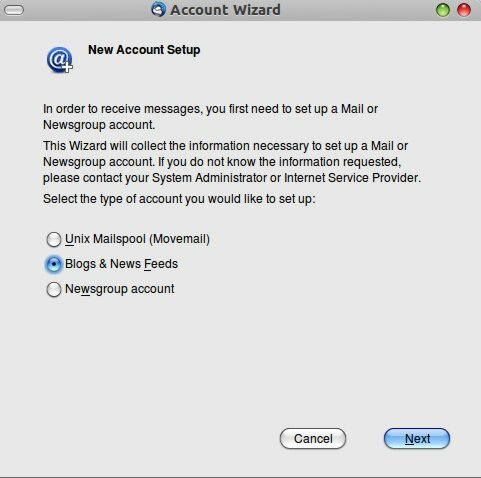 Then click on File -> New ->Mail Account, to begin the setup process. 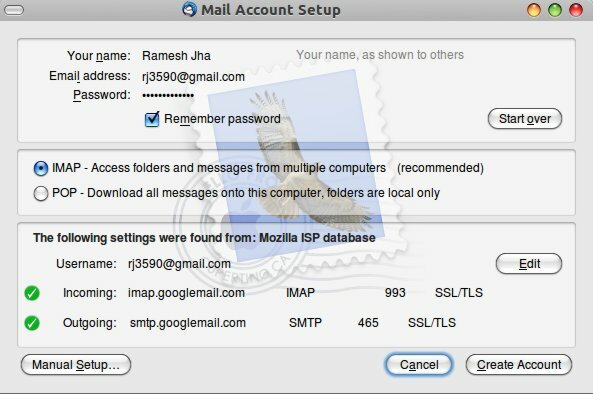 step 2 : Now, enter your email account details such as Name, Email Address, Password and click on ‘continue’ to go ahead. step 3 : Now your mail server configurations/protocols are selected. You can leave it default if you aren’t sure about that. Just click on Create Account button and wait for few moments; password will be validated and if everything is fine, then your account will be created successfully. 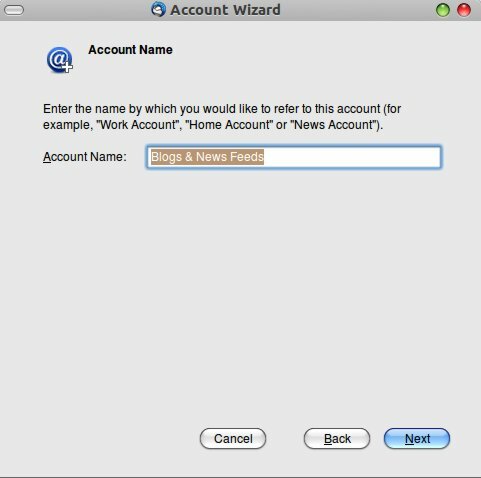 step 1 : Open Thunderbird and click on File->New->Other Accounts, then select ‘Blog and News Feeds’ from the list. step 2 : Now put any name for the account Name field, and click Next. step 3 : That’s all. You might have noticed a new section appearing in left panel (in Thunderbird), with the same name as you entered in step2, click on that, now click on ‘Manage Subscriptions’ and add the RSS URL e.g http://feeds.feedburner.com/sudobits. step 4 : You are Done! Enjoy reading news ..from your desktop, in a couple of clicks. Previous PostA new Q&A Community for Linux and Open source SoftwaresNext PostUbuntu 11.10 Beta 1 Released! I’ m running a huge problem with the configuration of Thunderbird in Ubuntu 11.04 natty version. Can anyone help me out the configuration….